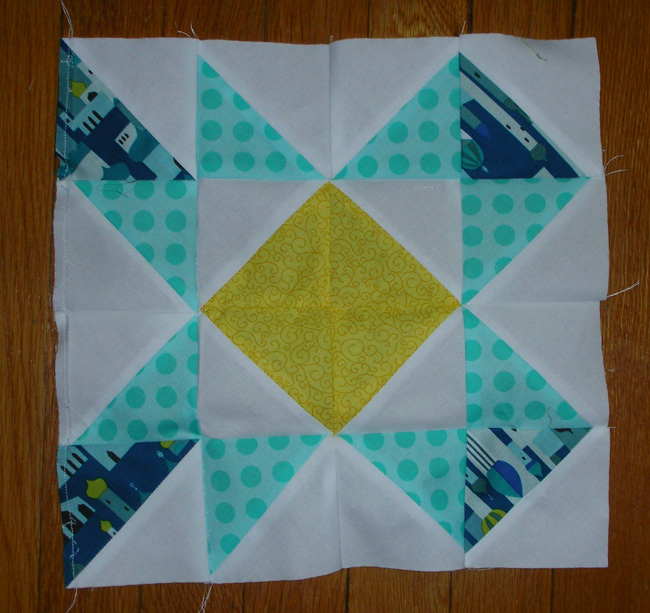 I’m participating in Jeni (of In Color Order)’s Half-Square Triangle Block of the Month quilt along. 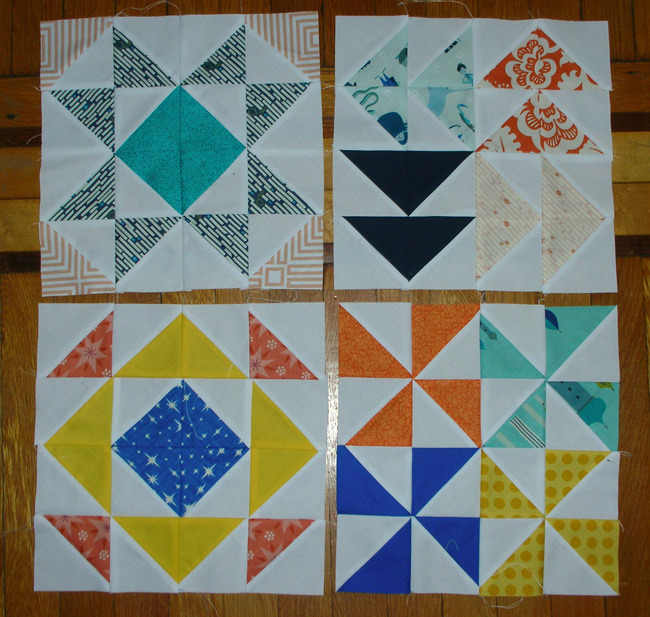 So far I’ve finished the blocks up through April, and I can’t decide if the pinwheels or the flying geese are my favorites. I am very proud of the way the pinwheels all line up in their centers, though. I’m not stopping with April, of course. And I thought I had finished May’s block, before I realized that I had flipped two of the light-blue half-triangle squares. I took the one side section off, flipped it 180 degrees, and thought “There! Now the light blue triangles are facing the right direction!” And then I looked at it, and realized that now the corner blocks faced the wrong way. I’m not very pleased by it right now, but once I’ve forgotten about the amount of ripping and re-sewing I had to do, I’ll probably be a lot happier with it. I’ll probably fix it over the weekend, and also get June’s block cut out, because it looks like one I’m going to like quite a bit. I’ve been half-seriously considering doing two blocks for each month, to put together a larger quilt top when this is all over. Of course, that simply highlights the fact that I haven’t the faintest idea what on earth this quilt will be when I finish it: a gift for someone, presumably, but for who? I have no idea. It’s funny: I appear to be very much a process quilter, while I’m sometimes a very product-oriented knitter or spinner. Who knew? Hi – I tried emailing you back about the blog hop but did you know you come up as a no-reply blogger? Can you send me your email address? Thanks for going out of your way to respond! I really appreciate it. I’ve emailed you. Previous Previous post: Mixtape quilt basted!